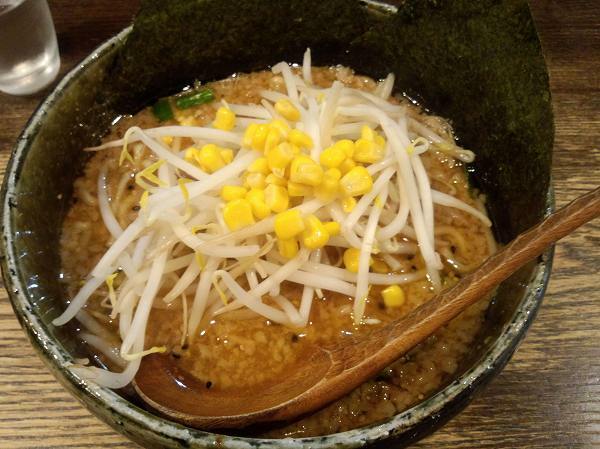 one that's delicious, But over the last couple of years several exceptional miso ramen have opened. 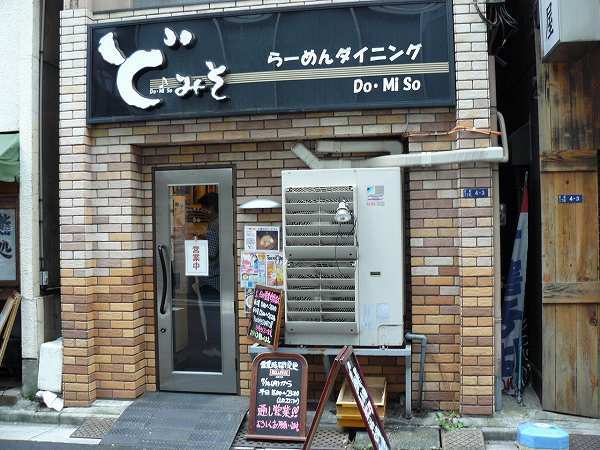 One of them is DO・MI SO at Kyobashi. 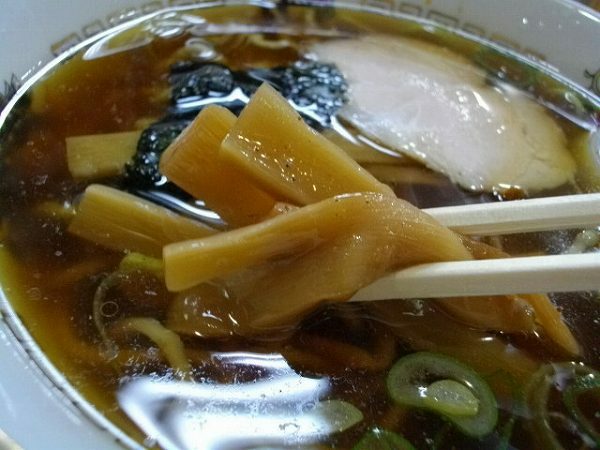 Do・Mi So's miso ramen uses more lard than normal miso ramen. 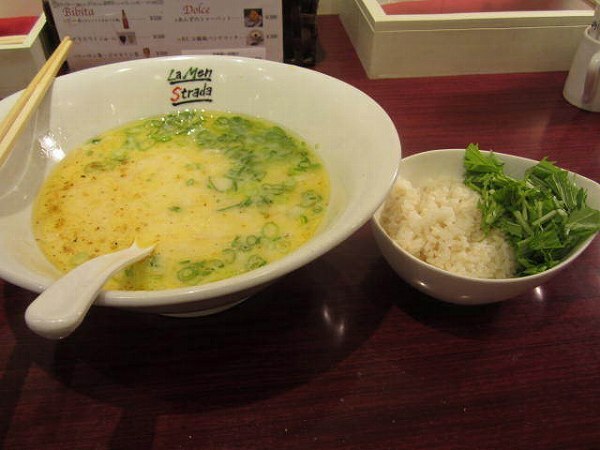 It is also saltier and broth thicker as well. 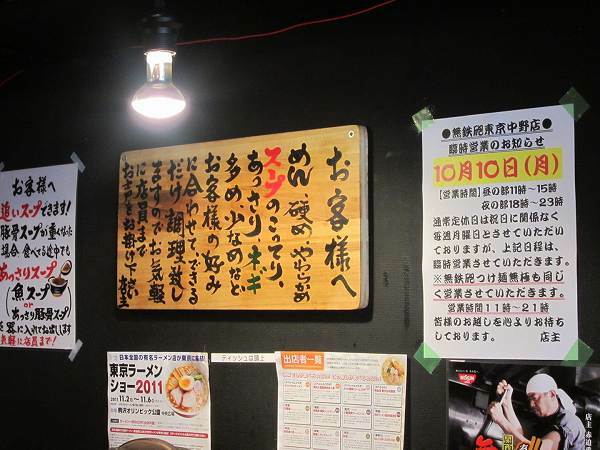 Their most popular ramen is TOKU MISO KOTTERI RAMEN (Special oily miso ramen) for 900 yen. 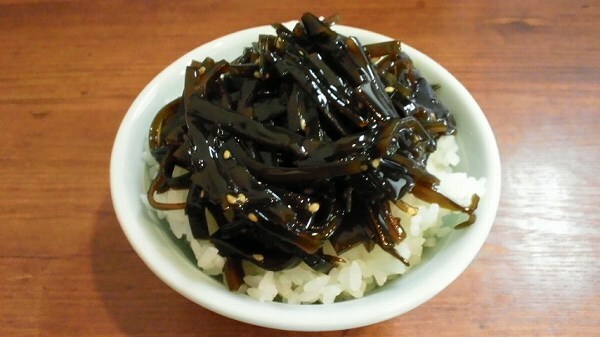 It has boiled bean sprout, corn, egg and also extra chashu (boiled pork), 2 pieces of nori (dry seaweed). It is not oily as it says it is and extra rich in flavor. 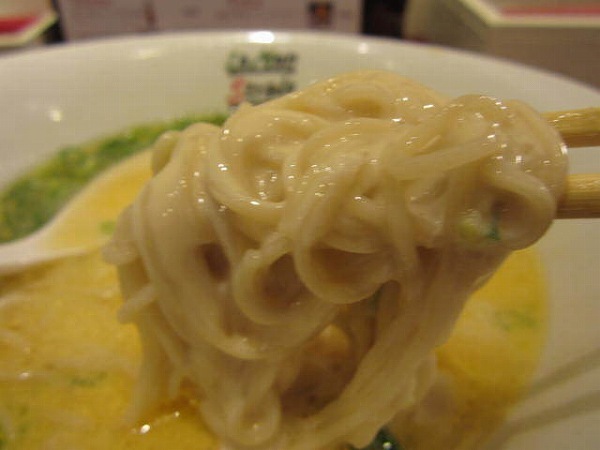 Noodles are thick and wavy. 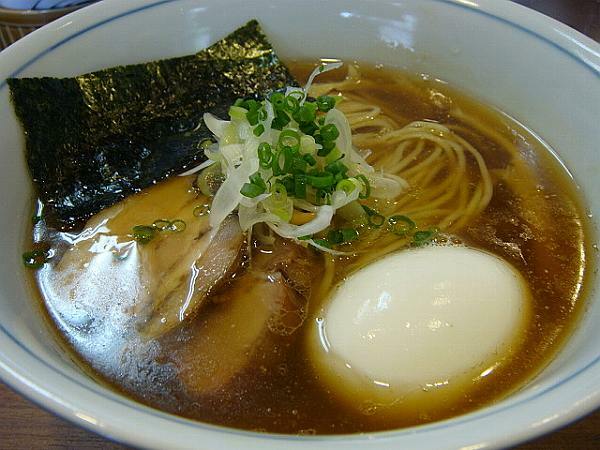 If you don't need extra chashu, nori and boiled egg, there is MISO KOTTERI RAMEN (Oily miso ramen) for 750 yen. 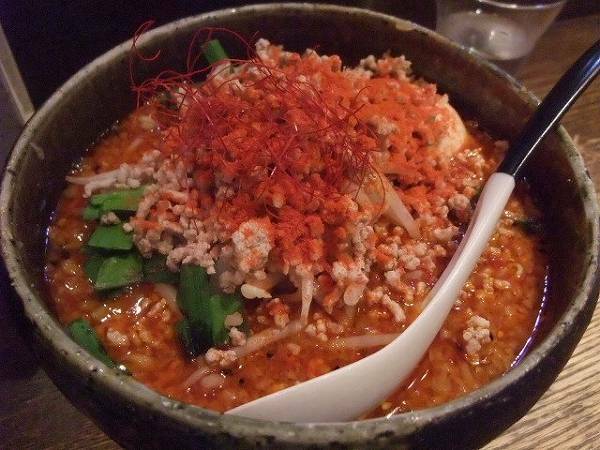 If you want to go spicy, try MISO OROCHON RAMEN (Spicy Mmso ramen) for 1,000 yen. 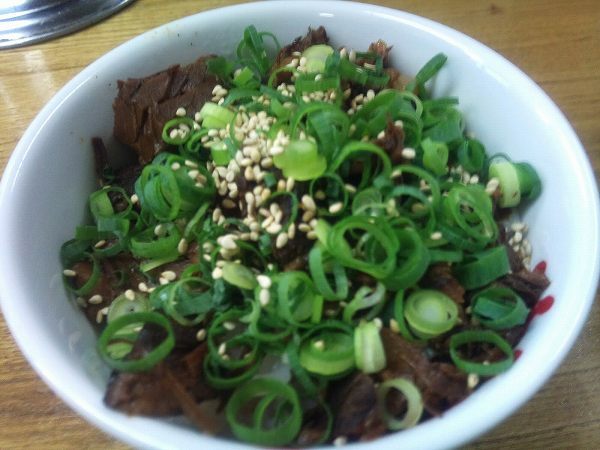 Its not as spicy as it looks and much milder than shops like Nakamoto. 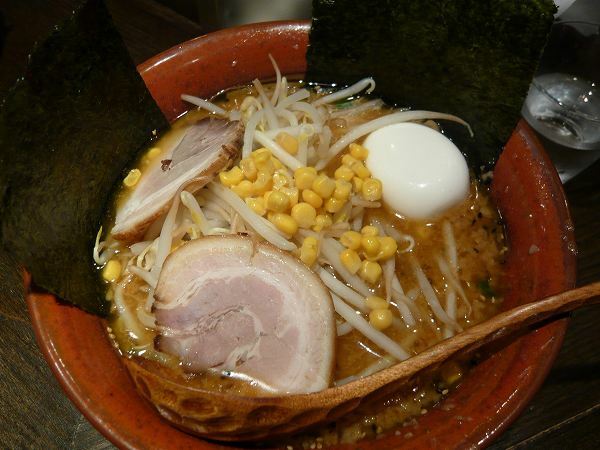 They have miso ramen with curry powder in it called MISO CURRY RAMEN for 1,000 yen. 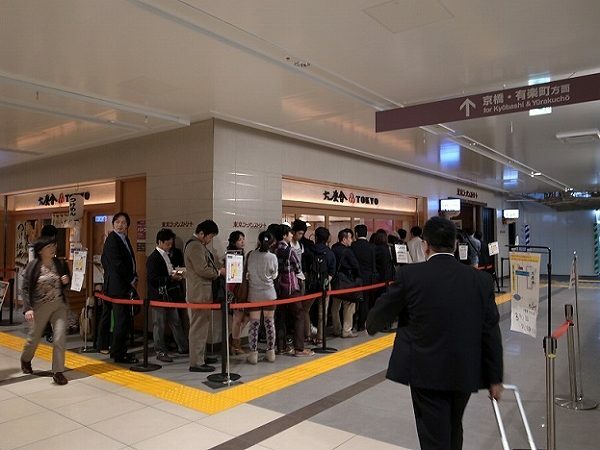 If you prefer tsukemen try TOKU MISO TSUKEMEN for 1,000 yen. 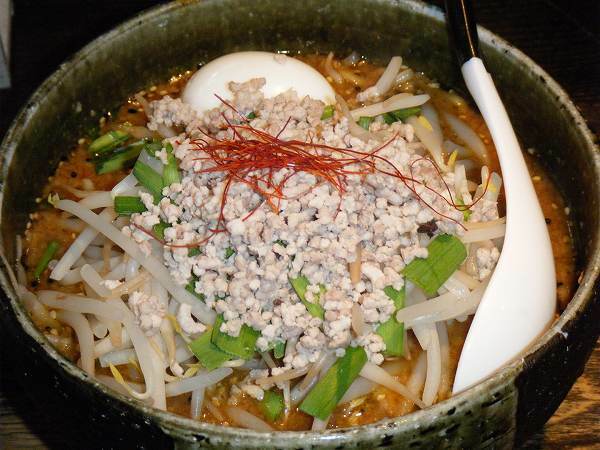 I would recommend to order Toku Miso Kotteri Ramen if its your first time at dining here. 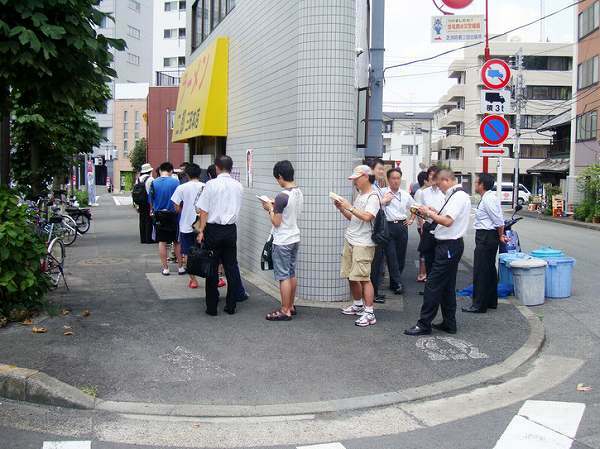 They have several other locations in Tokyo and as any popular ramen shop during lunch time, there is a line of people waiting to get inside. 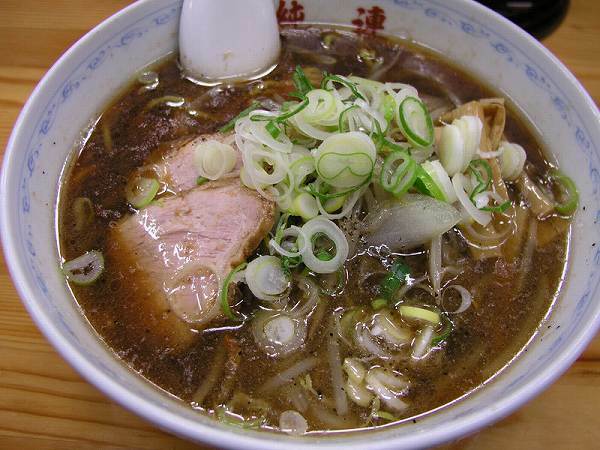 Ramen in Kyushu is different by each prefecture, but one thing in common is that they mainly use pork bone for broth. 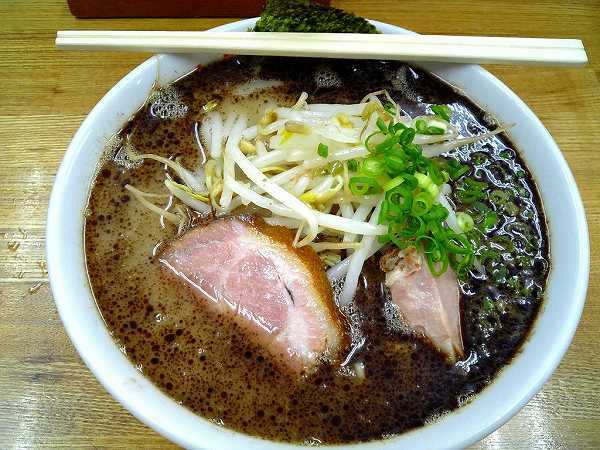 In Kumamoto, they use a black oil called Mahyu to add flavor to the ramen which is made out of fried garlic and pork lard. This mahyu is the sign of Kumamoto ramen and one of the most well known ramen shops which uses this is NANTSUTTEI at Shinagawa. 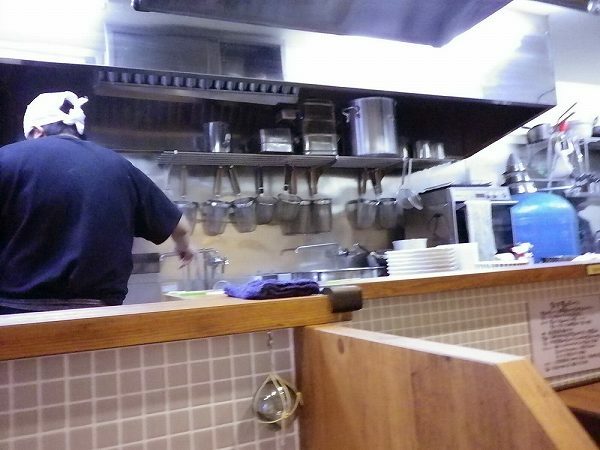 Nantsuttei's owner worked at one of the most famous ramen shops in Kumamoto for several years. 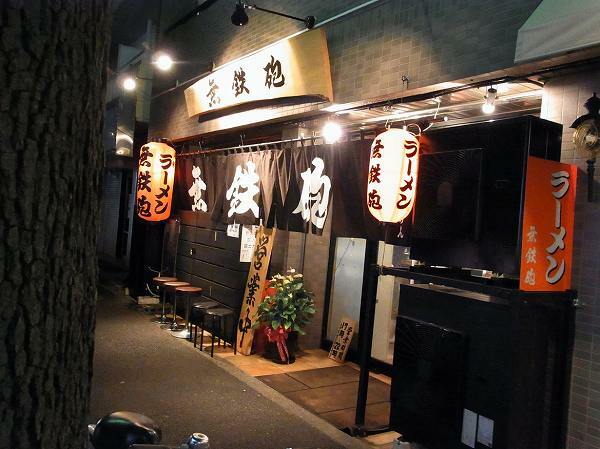 After he finished training, he opened his own shop in Kanagawa. 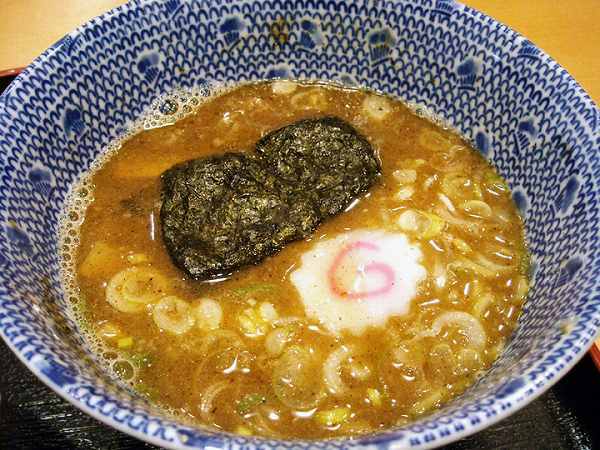 He didn't copy the entire recipe from his master, which he could have, but instead created his own Kumamoto style ramen. 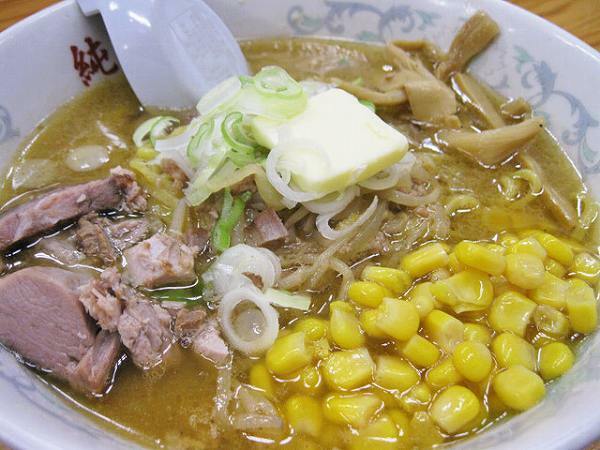 This ramen has become one of the most popular ramen's in all of Japan now. 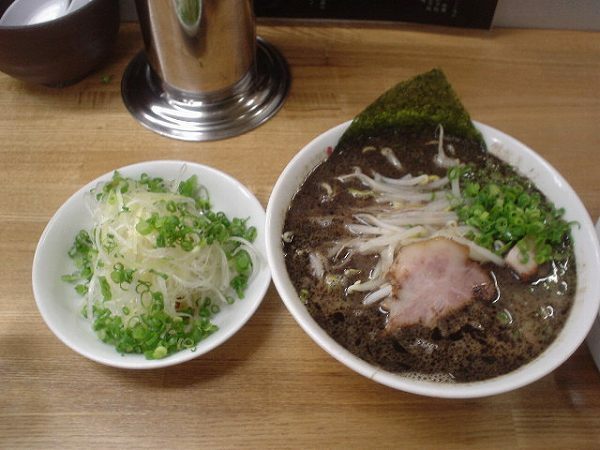 Ramen for 700 yen which comes with 2 slices of chashu, boiled bean sprouts, spring onions, and nori (dried seaweed) on top. 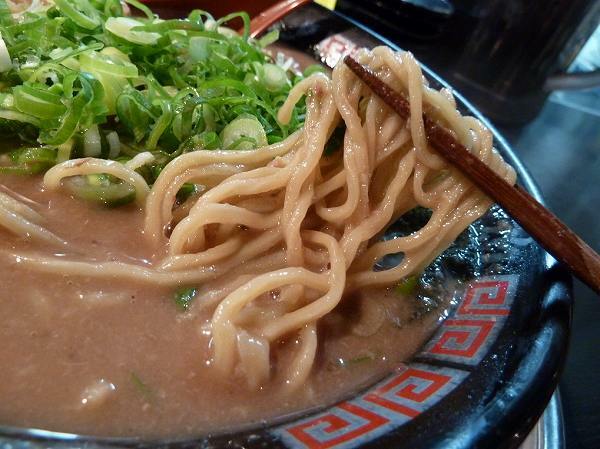 The noodles are rather thin compared to other Kumamoto ramen, but it marches with the broth. 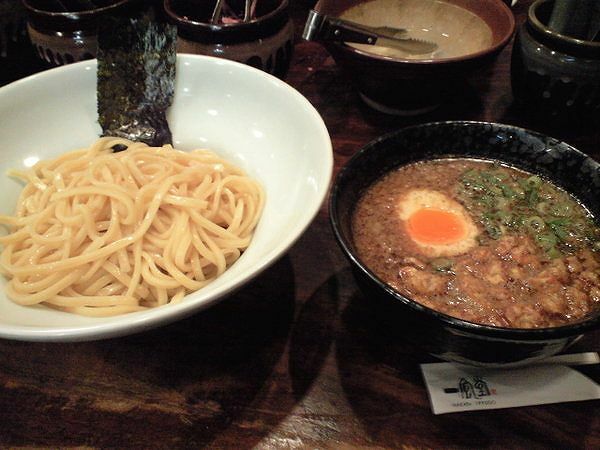 or if you want it all, there is NANTSUTTEI SPECIAL (Ramen with extra chashu, negi & boiled egg). 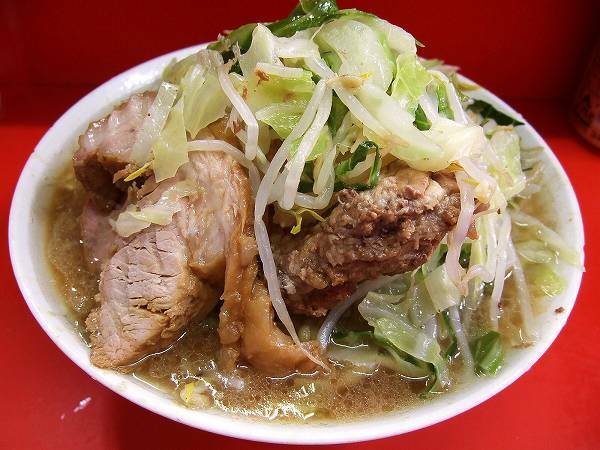 or a really heavy ramen, BOKU NO SORA (Ramen with dried fished based soup added to regular ramen soup) for 780 yen. 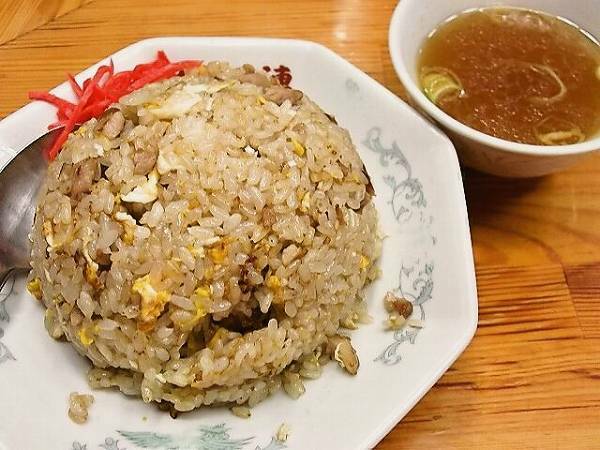 or HITOKUCHI MESHI (Small rice) for 100 yen, which you can add to the soup after finish eating the noodles. 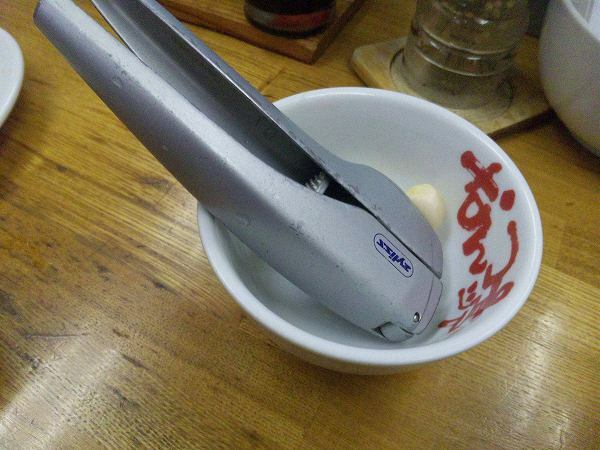 They have a garlic crusher on the table so you can add fresh garlic to your ramen if you like, which most customers do. 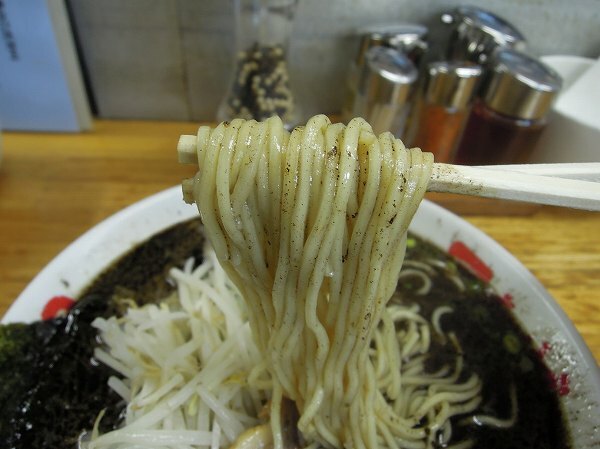 Nantsuttei has become one of the most famous ramen shops in Japan now because the owner is often on ramen TV programs. 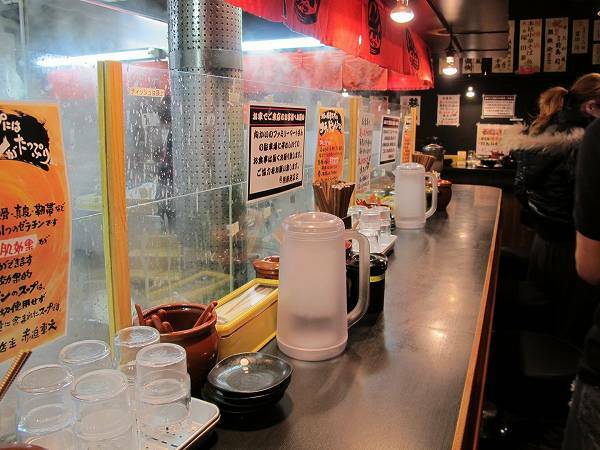 Because of this, ramen lovers from all over Japan come to eat at Nantsuttei and most of them leave satisfied They have another location in Ikebukuro and also in Singapore as well. Right outside of Shinagawa station in a small area where 7 ramen shops are. 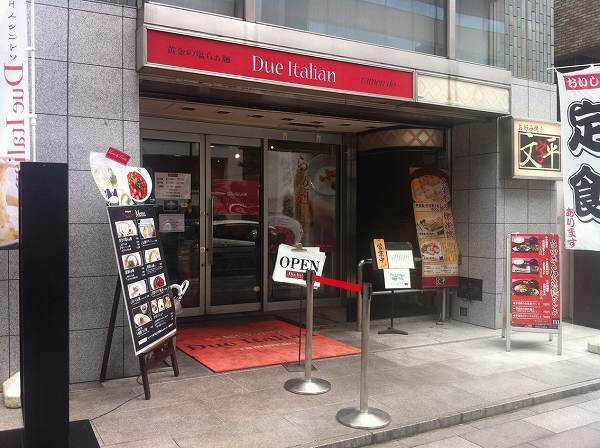 A ramen shop with an Italian name sounds strange, but owner/chef of Due Italian was an Italian chef before becoming a ramen chef. 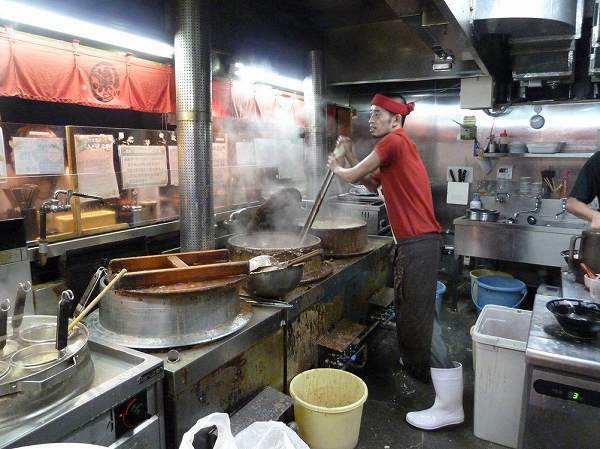 When he quit his job at an Italian restaurant, he trained/worked under a famous ramen chef who has his shop in Yokohama. 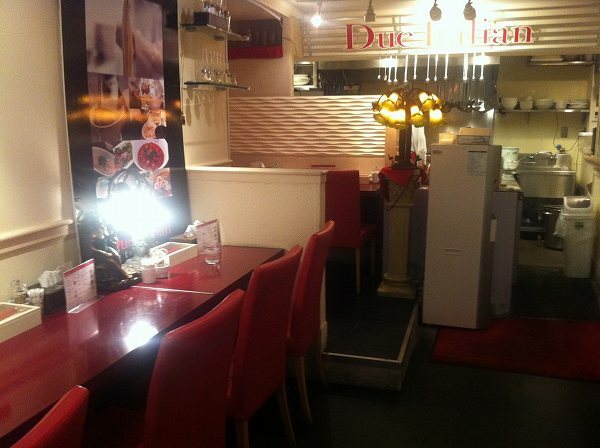 After a year working at his restaurant, he opened DUE ITALIAN at Ichigaya. 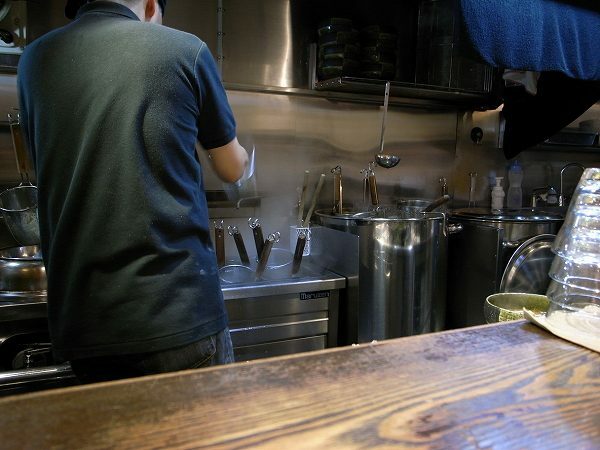 The ramen shop he worked at is known for not using any MSG and its Shoyu ramen (soy sauce flavor ramen). 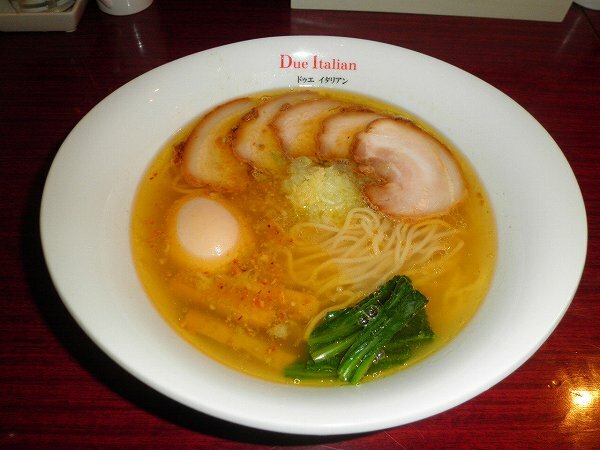 So, when he opened his own shop, he decided to open a SHIO RAMEN (Salt ramen) shop and added his Italian background to it. 780 yen for a regular shio ramen and if you want a soft boiled egg and extra chashu (boiled pork) in it like the above, its 1,000 yen. 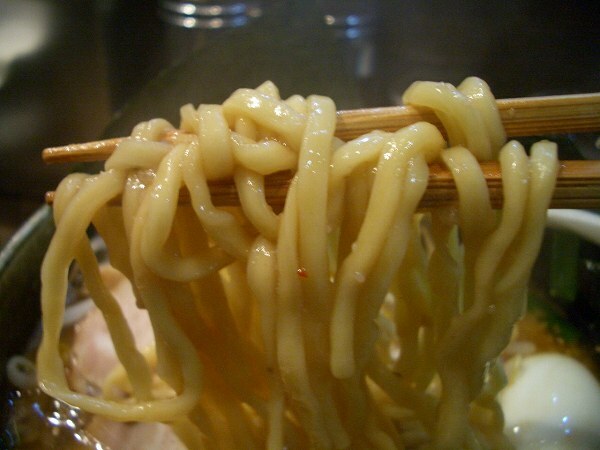 The clear broth is almost a golden color and he named it OOGON-NO SHIO RAMEN, which means golden shio ramen. 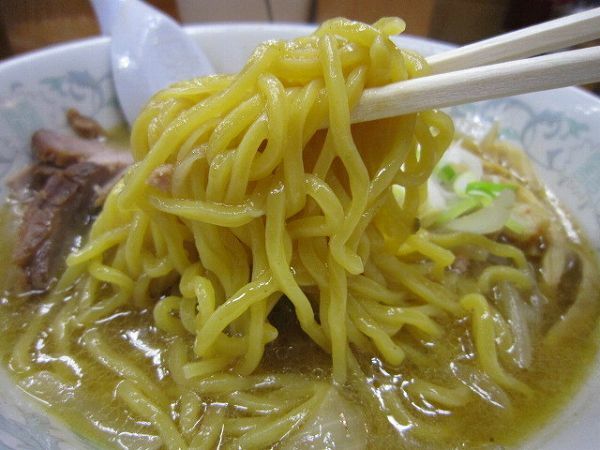 The other ramens here all have an Italian influence which you will not find at any other ramen shop like RAMEN FROMAGE for 980 yen. 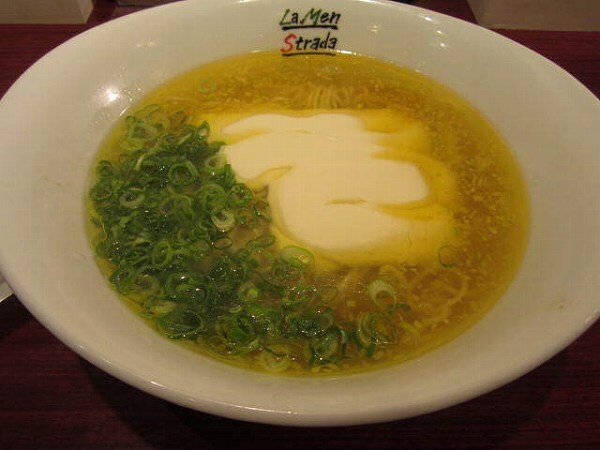 Its Shio ramen with cheese. The cheese is a mix of gorgonzola and cream cheese. 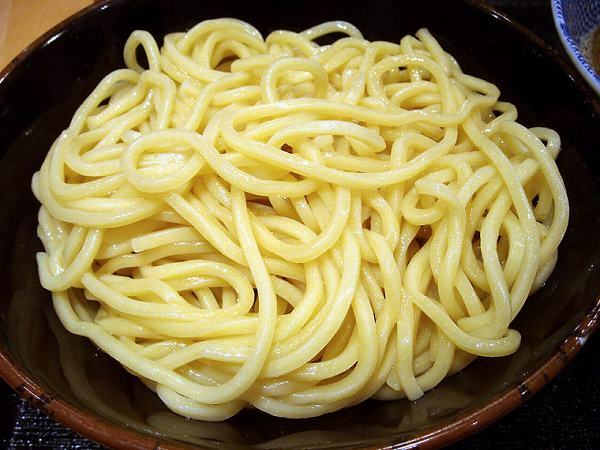 When you eat the cheese and noodles together, it looks like you are eating carbonara pasta. 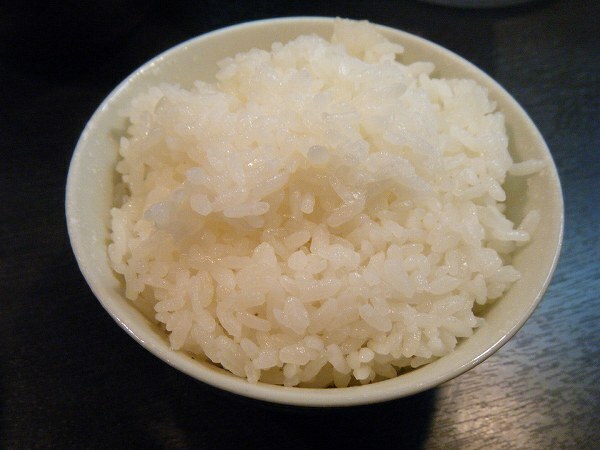 It also comes with rice. Add it to the soup after finishing the noodles and this looks like you are having a cheese risotto. 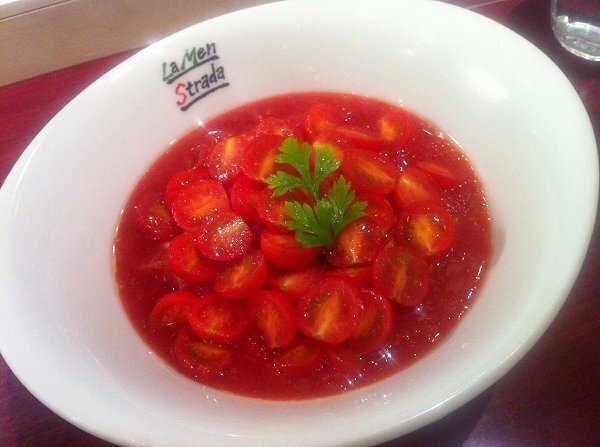 They also have REISEI ITALIA MEN AKA (Cold cherry tomato ramen) for 1,200 yen. 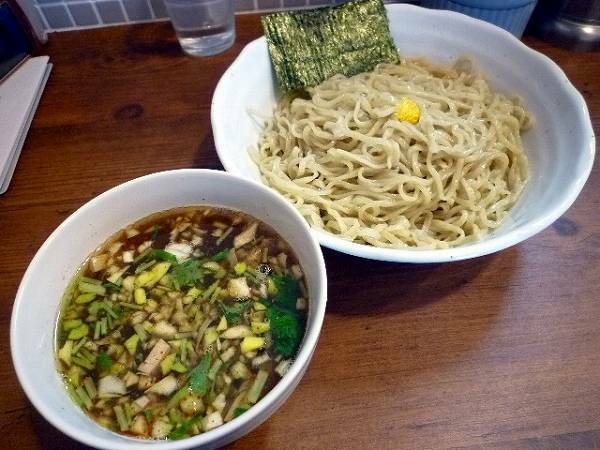 This ramen is somewhere between ramen and Italian, but it is surprisingly delicious. They also have SHOYU RAMEN as well now. 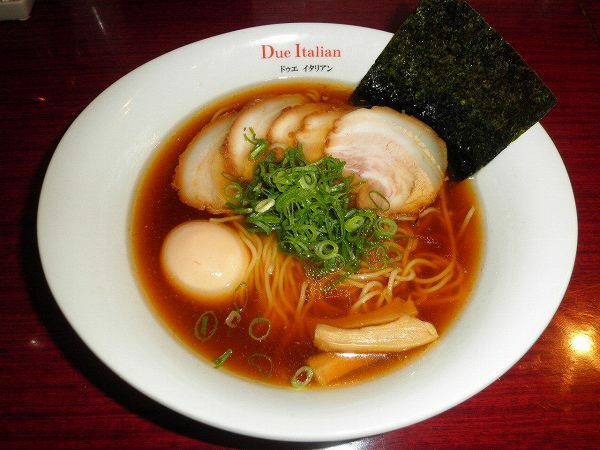 Some Japanese people think that Due Italian's ramen is a bit strange since cheese and tomatoes are used in it, but if you try their regular Shio ramen its as normal and good as any Shio ramen in Tokyo. 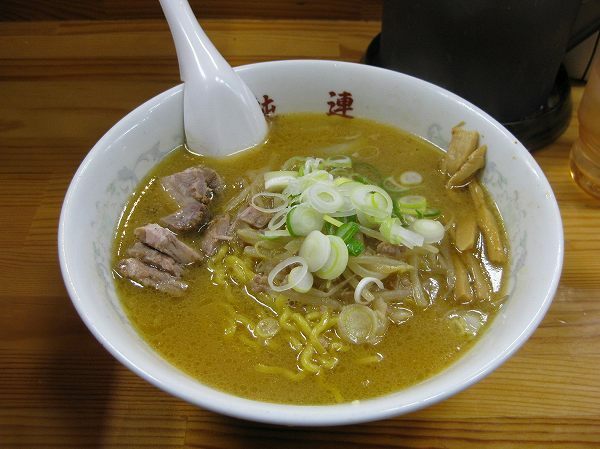 So, try the Shio ramen first, if you enjoyed it then move on to the Italian influenced ramens, which are all very good as well. 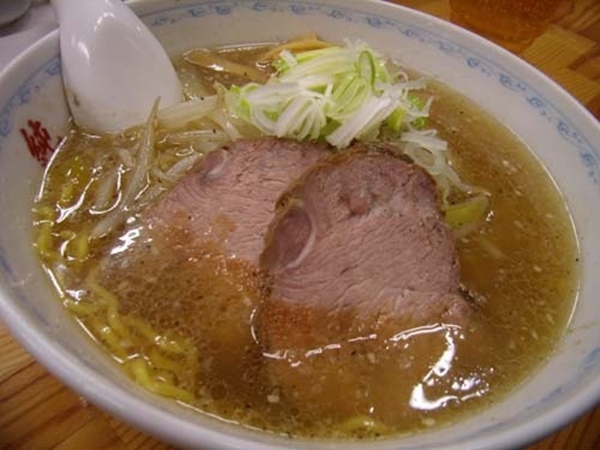 Miso Ramen was invented in Sapporo in the late 50's. 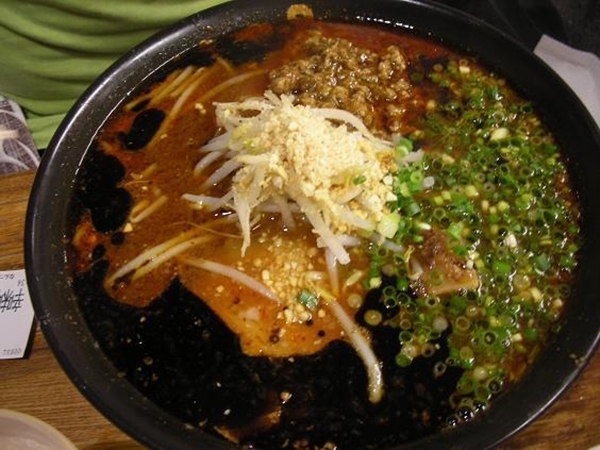 As you might know Sapporo is real cold during the winter and people warmed up by eating Miso ramen and the most famous Miso ramen shop in all of Japan is JUNREN, which opened a shop at Takadanobaba about 10 years ago. 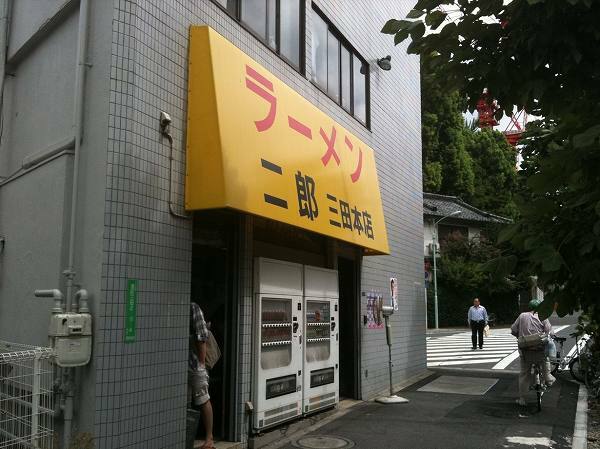 Before Takadanobaba besides their original shop in Sapporo, they had a shop at Yokohama Ramen Museum for several years. 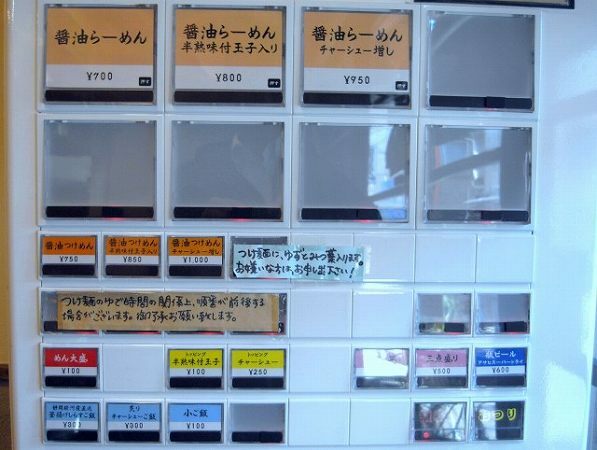 It was the most popular shop among all the ramen shops there with an average wait of one hour. 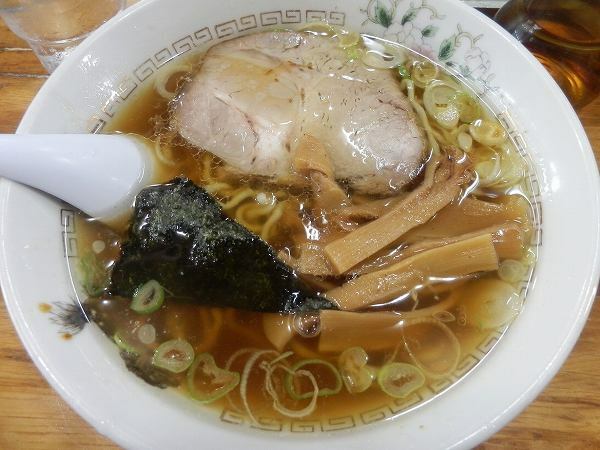 Junren's signature ramen is MISO RAMEN. 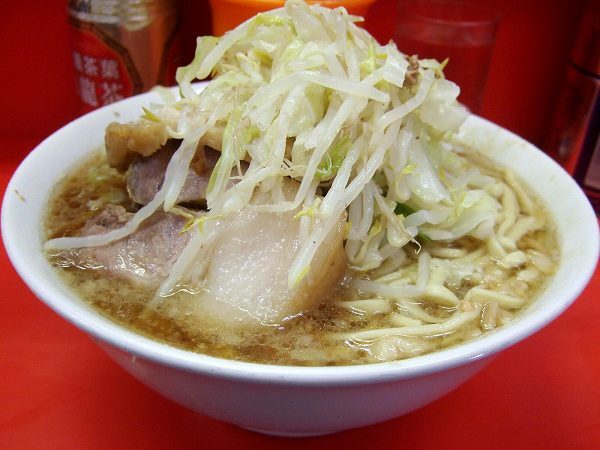 By many ramen freaks, its been voted the best Miso ramen for the last 10 years and I have to agree with them cause I only eat Miso ramen here and no Miso ramen comes close to Junren's. 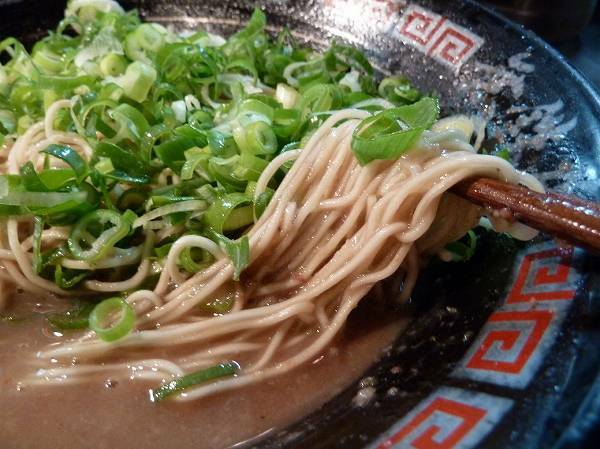 The noodles are different from the noodles you find in Tokyo or other areas of Japan. 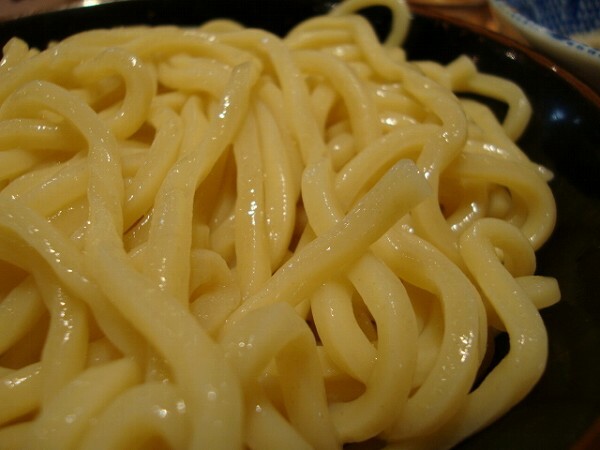 They are egg noodles with very limited water used when mixed, which makes the noodle very hard even if you boil it for a long time. 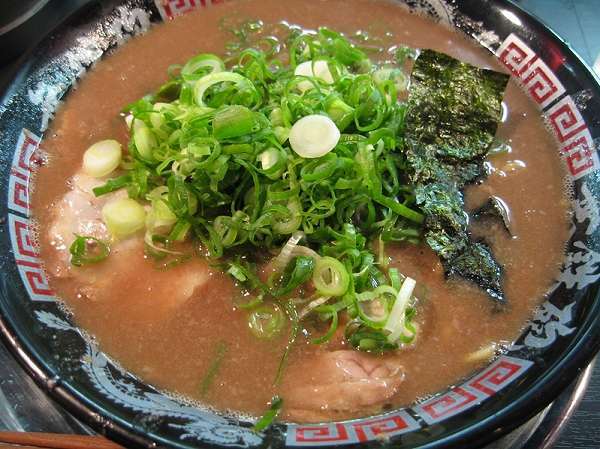 Then there is SHIO RAMEN (Salt ramen) which is the least popular among the three. 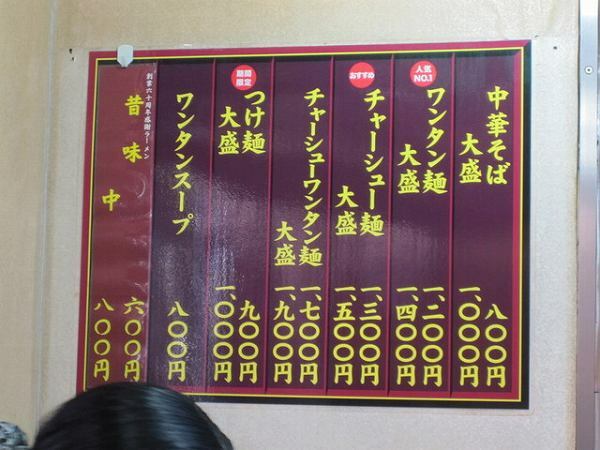 Miso, Shoyu, Shio ramen are all for 850 yen. 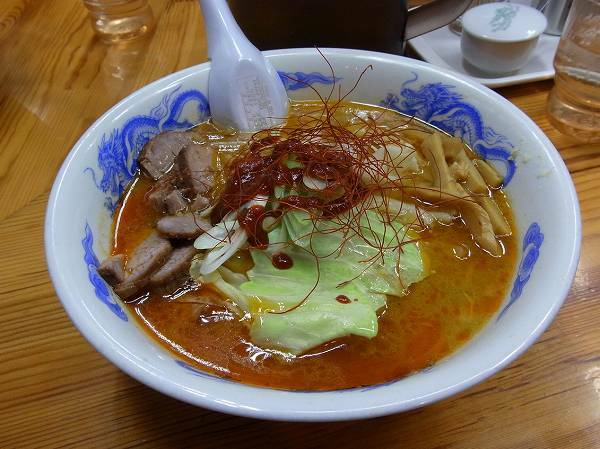 KARAMISO RAMEN (Spicy miso ramen) for 950 yen is only available at this shop only, not at the main shop in Sapporo. 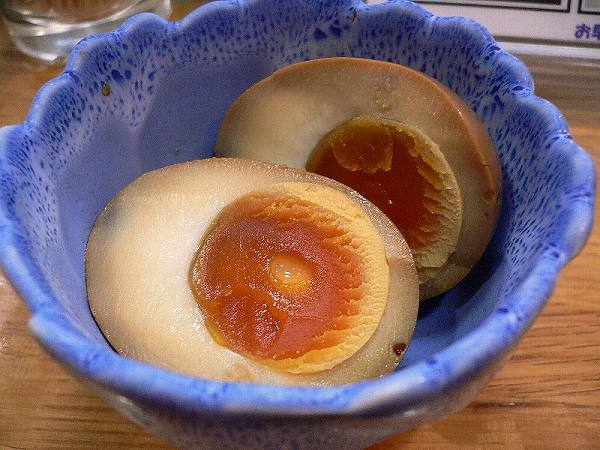 and the most popular is HANJUKU TAMAGO (Soft boiled egg) for 100 yen each. 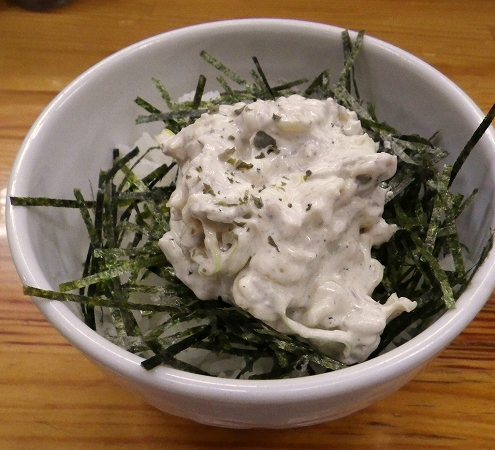 and also CHAMAYO DON (Roast Pork Mayo over Rice) for 250 yen. 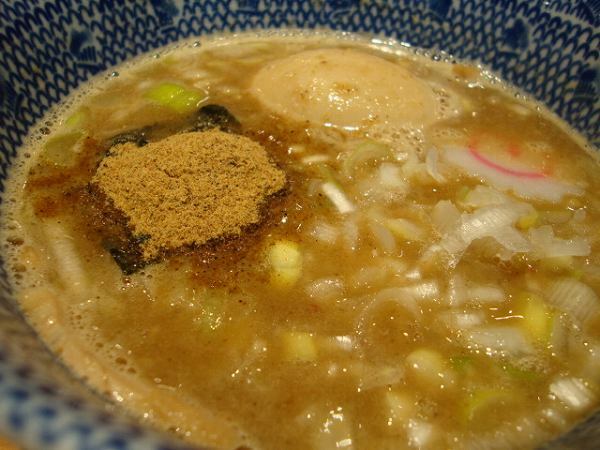 The first time I had Junren's Miso ramen was 23 years ago at Sapporo. 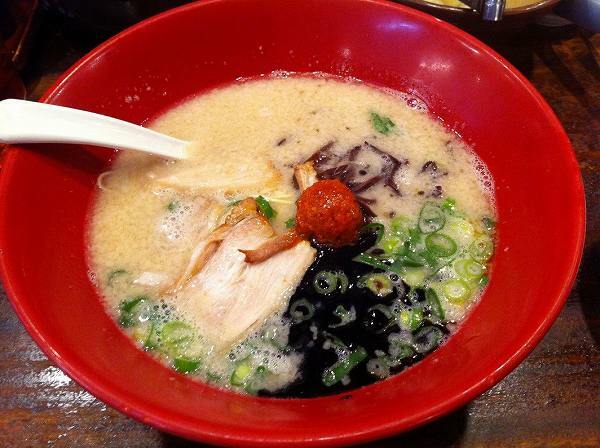 I've had Miso Ramen in the past, but Junren's was so different from what I had in Tokyo. 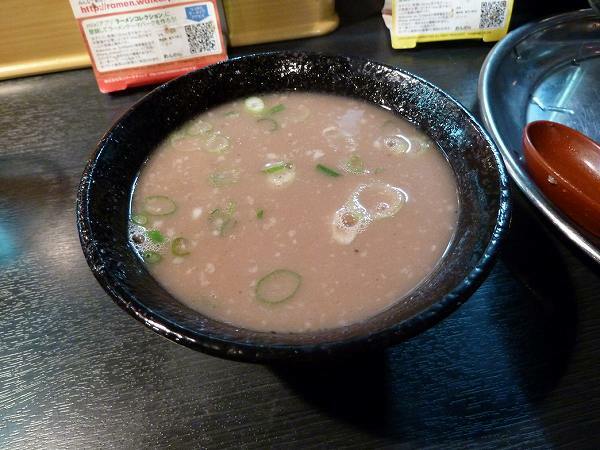 It was rich in flavor, a bit salty and the soup was covered with a thin layer of hot lard, which keeps the soup warm until you finish drinking the very last drop. 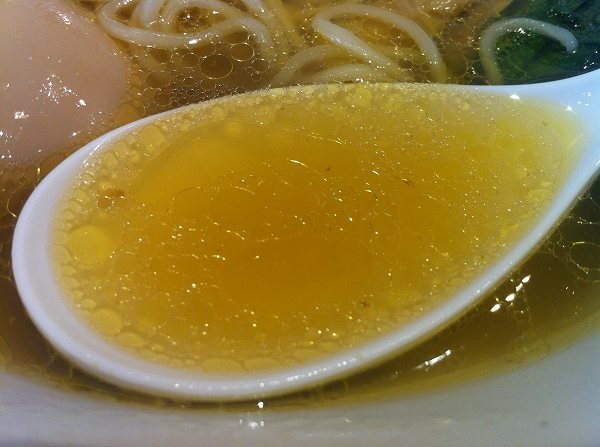 I actually burned my lips and tongue since no one explained to me how hot the soup was, so be careful when you drink the soup. 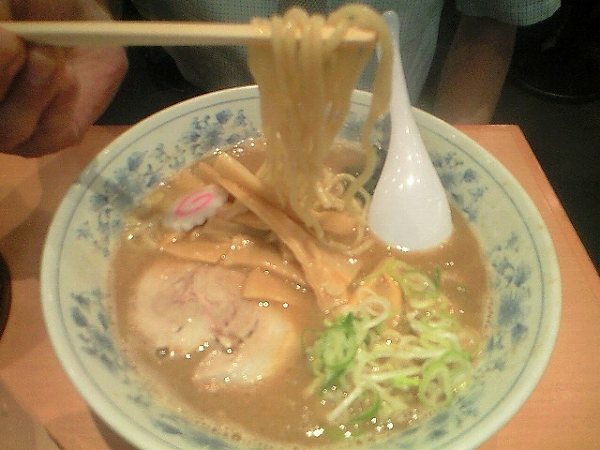 At Fukuoka, people only eat Tonkotsu (Pork bone soup) Ramen. 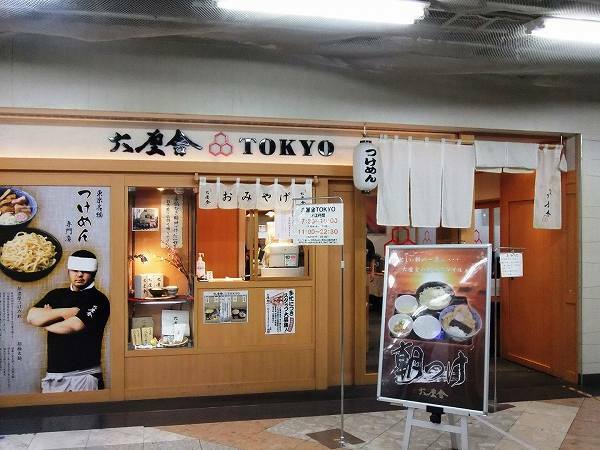 25 years ago, you had to go to Fukuoka to have some, but now its available all over Tokyo and the most famous Tonkotsu ramen shop in all of Japan is IPPUDO which has multiple locations in Tokyo. 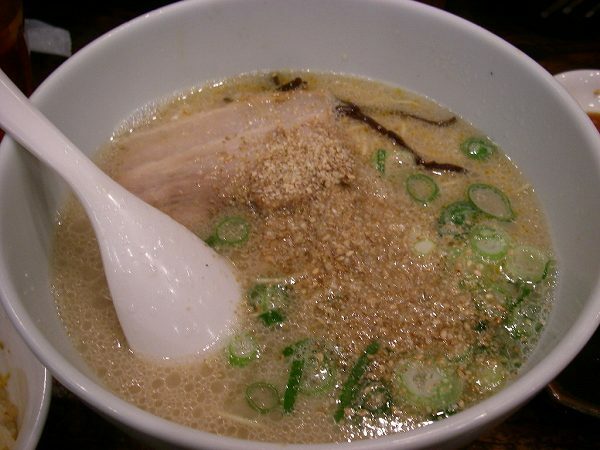 Ippudo became famous because it won the grand prize at a ramen competition TV program about 15 years ago. They originally had only one shop in Fukuioka, but now they have over 50 shops through out Japan and also in Singapore, Hong Kong, Los Angeles, New York. 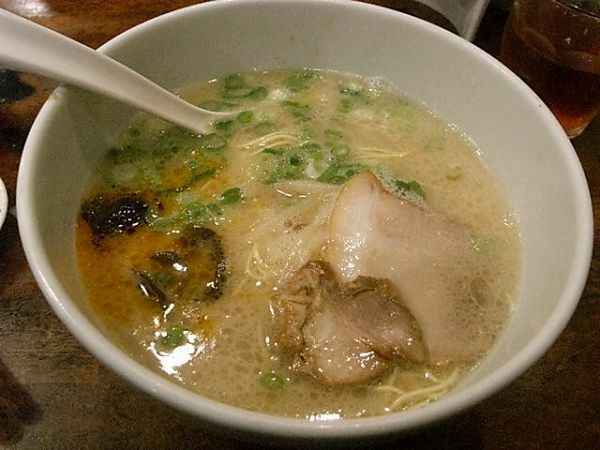 Compared to other Tonkotsu ramen shops, Ippudo uses original names for their ramens and they are also a little different from others. 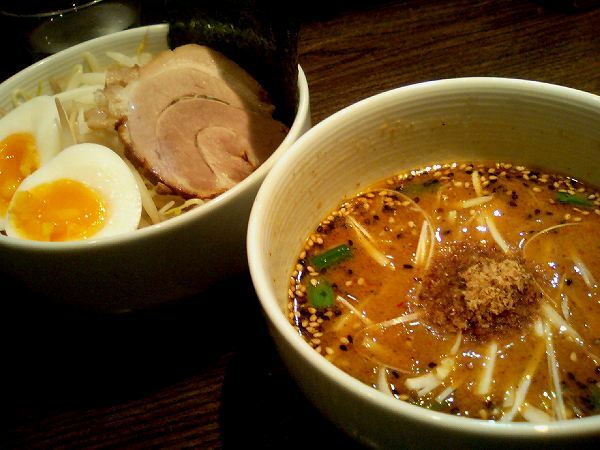 The basic ramen at Ippudo is called Shiromaru Motoaji (Original Simple Ramen) for 750 yen. 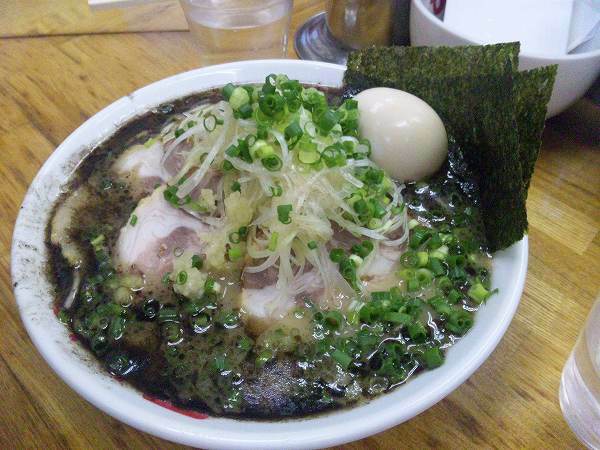 Unlike other Tonkotsu ramen's its not as oily and the smell of pork is limited. 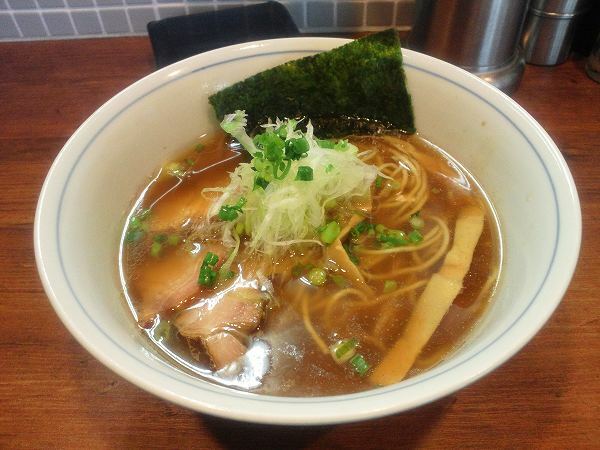 My favorite is AKAMARU KASANEAJI (Rich Flavor Ramen) for 850 yen. 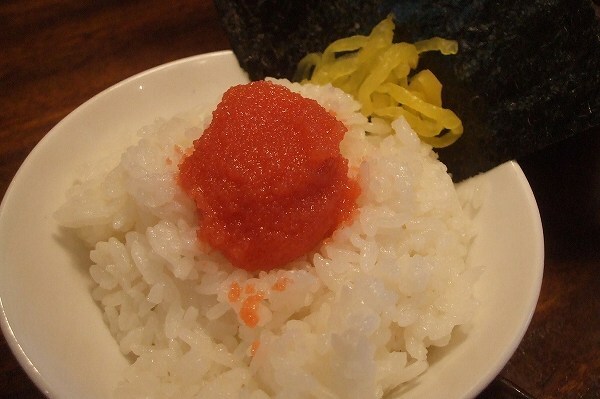 It has Mayu (fried garlic oil) & red pepper paste in it, but its not spicy at all. 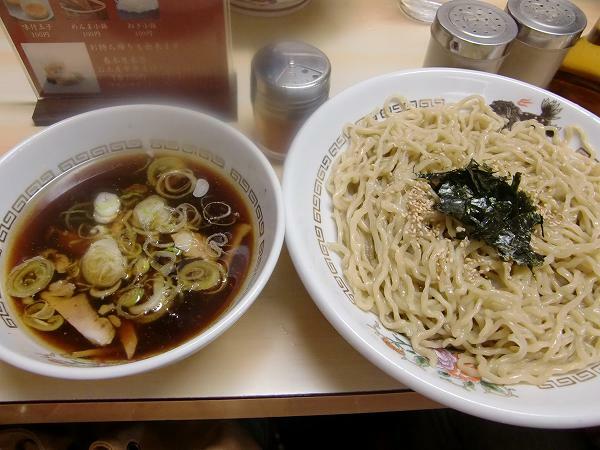 and also TSUKEMEN for 880 yen. 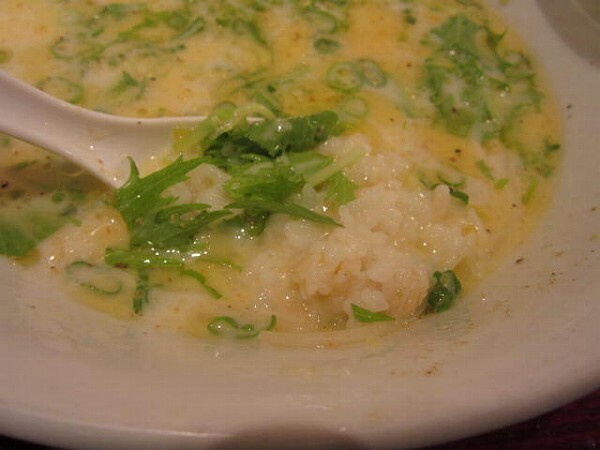 and also METAIKO GOHAN (Rice with Season Cod Roe) for 280 yen, which you can only find at Fukuoka style Tonkotsu ramen shops. 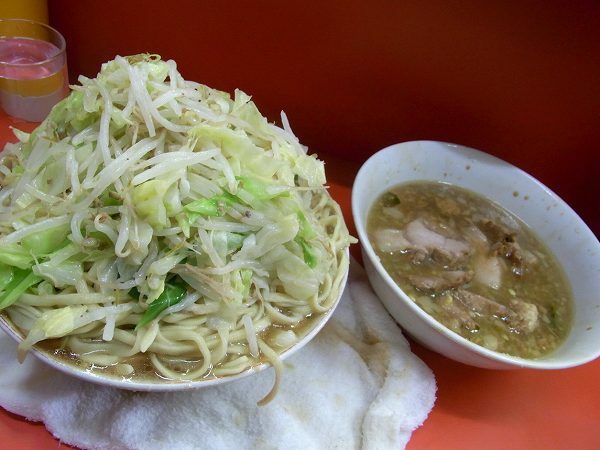 The portion of noodles are about half the size of normal ramen. 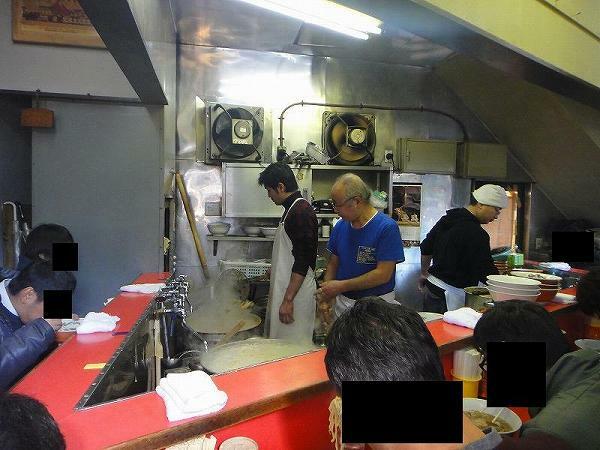 Because of this people order extra noodle, which is called KAEDAMA for 100 yen. 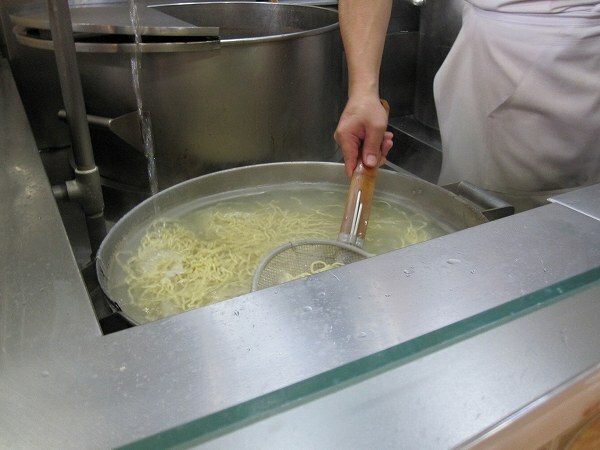 You can also choose how hard/soft you want your noodles cooked. 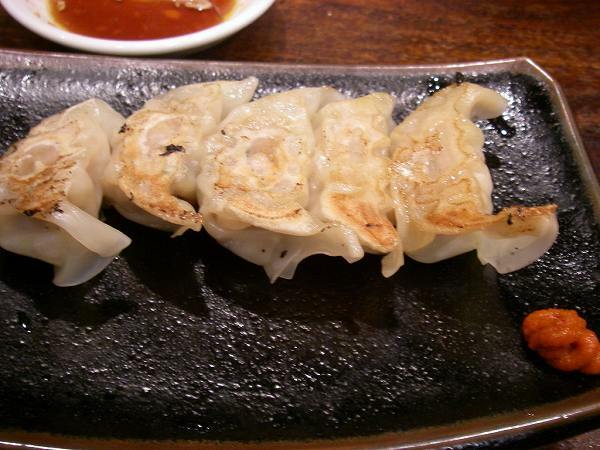 Ippudo is family friendly, young staff, great service, clean, modern and taste good for almost everyone. 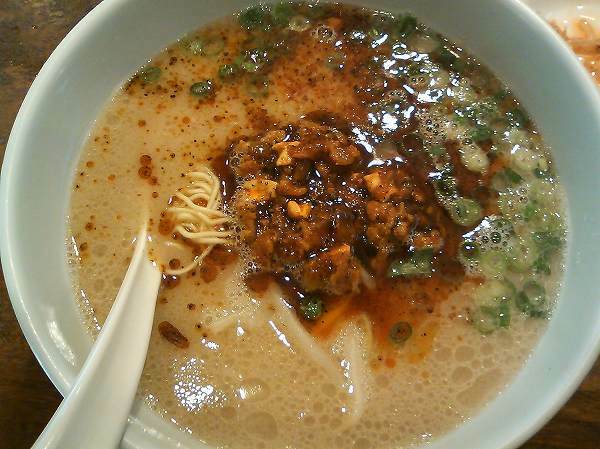 So if you wanna try Tonkotsu ramen for the first time, I highly recommend to try out Ippudo and then try other shops. 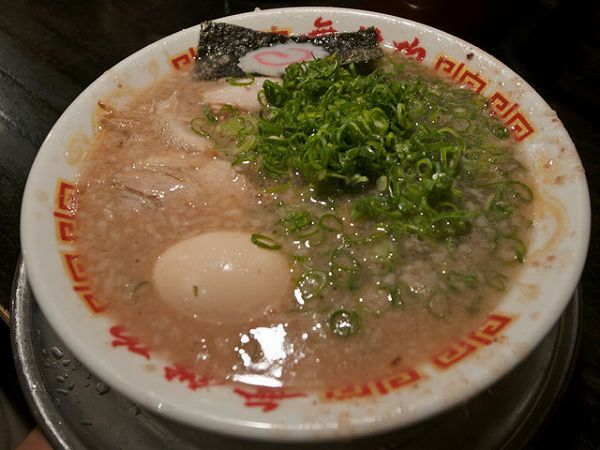 It has kind of become the standard of Hakata style Tonkotsu ramen for most people in Japan. 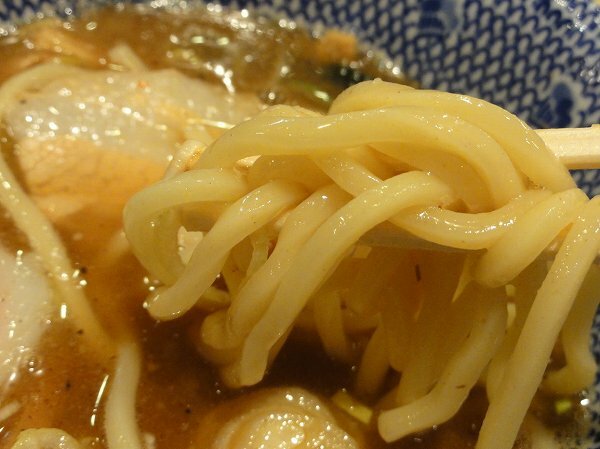 Many new ramen shops which opened in the last few years have been only using organic ingredients and also not using MSG. 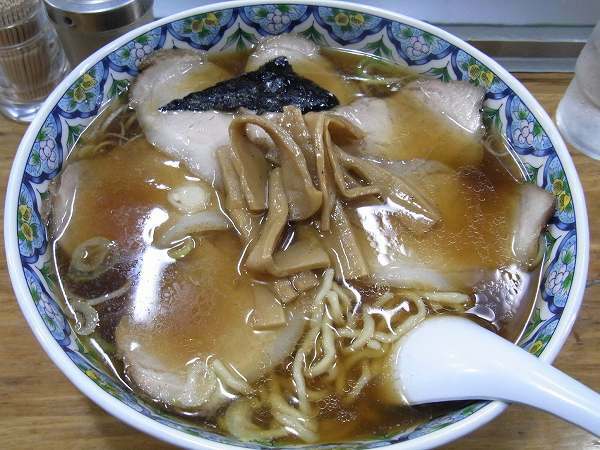 It is difficult to creative great ramen without MSG, since MSG gives you umami (deep flavor). 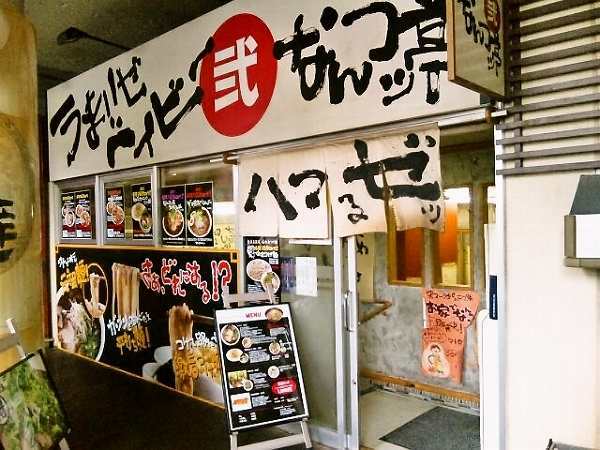 Most shops are always missing umami and leave customers unsatisfied, but BIGIYA at Gakugei-Daigaku is one of the few ramen shops which creates great ramen soup without using MSG. 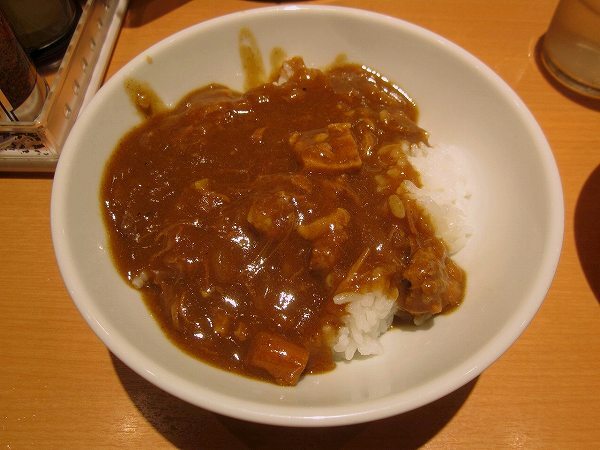 The owner of Bigiya worked/trained at Setagaya group, which is known for not using MSG and has over 10 stores in Tokyo and also one in New York. 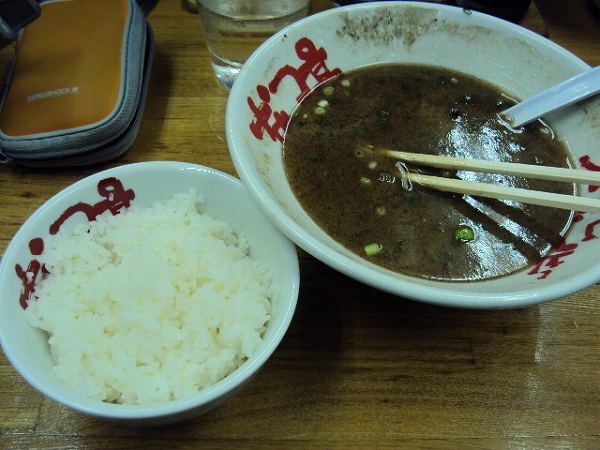 I wasn't a fan of any of Setagaya group's ramen shops since for me, the soup was always missing umami. So when I heard of the opening of Bigiya, I had some doubt that the ramen will be similar to Setagaya group, but I was wrong. 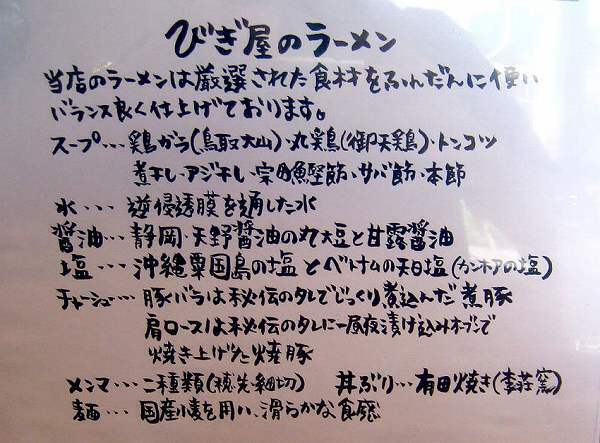 Unlike most ramen shops, there is a list of what they use and where its from at every table. 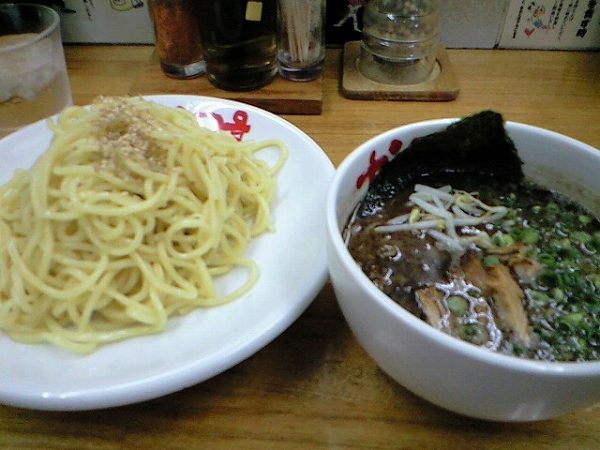 SHOYU TSUKEMEN (Soy Sauce Tsukemen) for 750 yen. 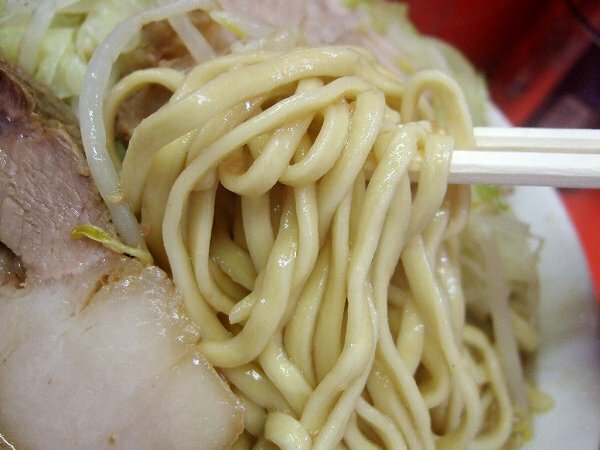 The noodles for Tsukemen are a little thicker than ramen, but it is still thin compared to other tsukemen's. 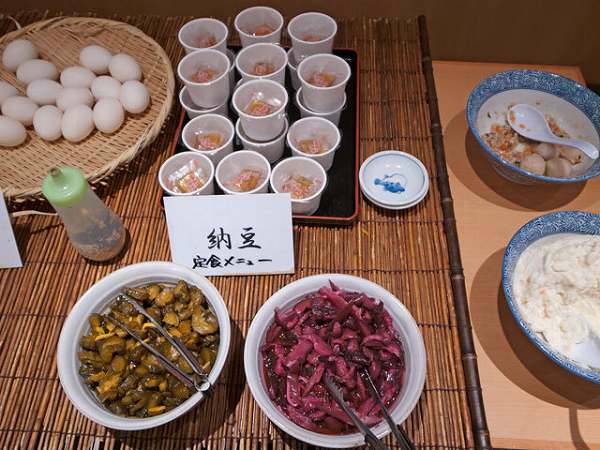 You can add HANJYUKU AJITUKE TAMAGO (Seasoned Soft Boiled Egg) for 100 yen, extra CHASHU (Roast Pork) for 250 yen and OHMORI (extra noodles) for 100 yen. 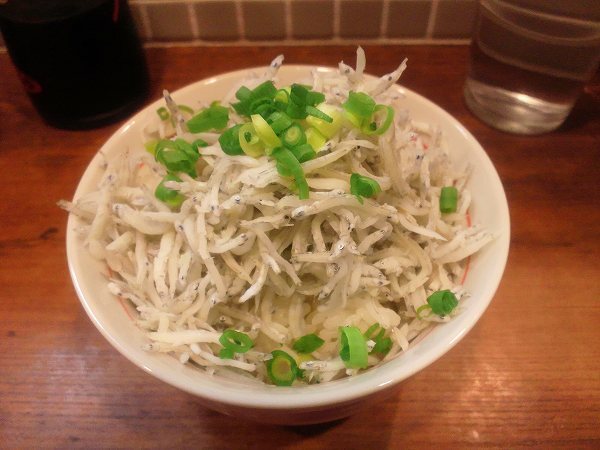 and KAMAAGE SHIRASU GOHAN (Boiled Whitebait over rice) for 300 yen, which I always order with ramen. 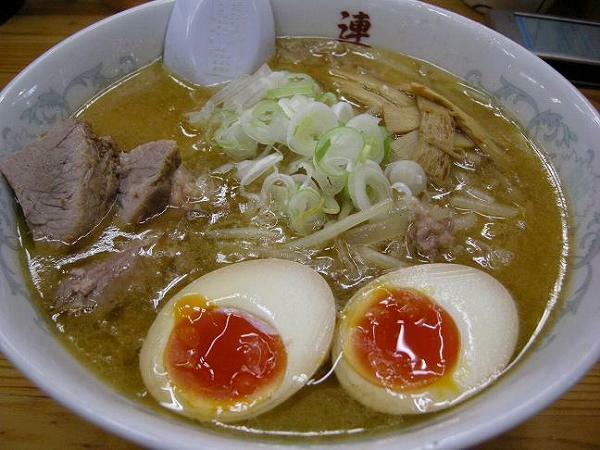 Since Gakugei-Daigaku is a residential area, which is 7 minutes away from Shibuya by train, most customers are usually locals living near Bigiya, but you do see ramen freaks from all over Japan as well taking pictures of the ramen and shop. 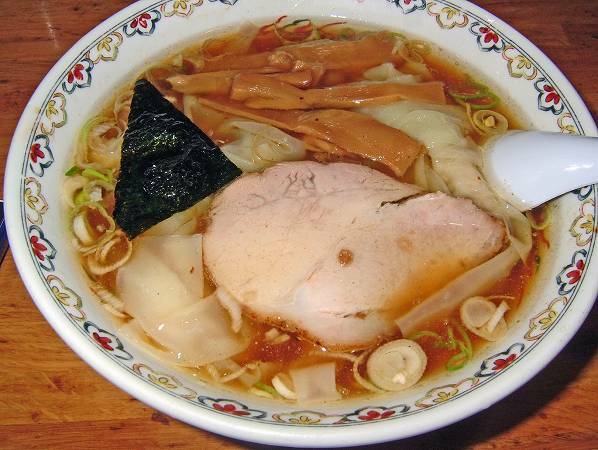 If you like Shoyu ramen without any MSG in it, Bigiya is one of the few places I can recommend. Keio University and Waseda University are 2 of the best private universities in Japan and arch rivals as well. (like Cambridge vs Oxforrd, Harvard vs Yale) Two of my former colleagues graduated from Keio and Waseda, They would often talk about which school did better in various sports that year. One day, the Keio graduate was bragging that Keio won almost every sports match that year and Waseda had nothing. The guy who went to Waseda got upset and said "We have more trophies than Keio in total, but the only thing that Keio has and we don't is RAMEN JIRO." I started to laugh, but it was the best example I ever heard about the two schools. 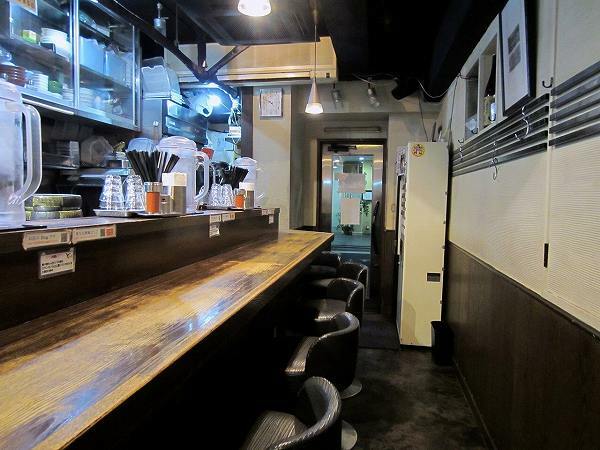 Ramen Jiro is in Mita and right next to Keio University. 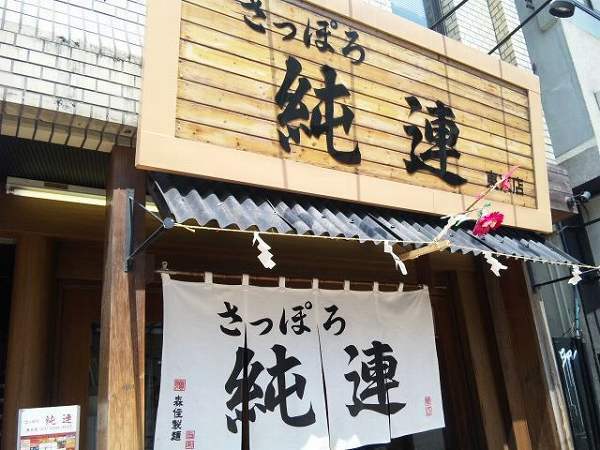 Its been there since early 70's and immediately became popular among Keio students, but 40 years later people who worked under owner/chef Hiromi Yamada have opened their own shop using the name Ramen Jiro in various parts of Kanto region and there are over 40 of them. 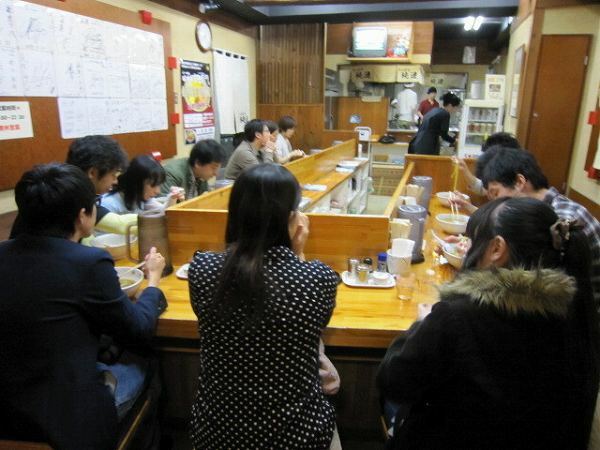 There are also over 20 people who worked under Yamada not using the name Ramen Jiro, but serving the same type of ramen. 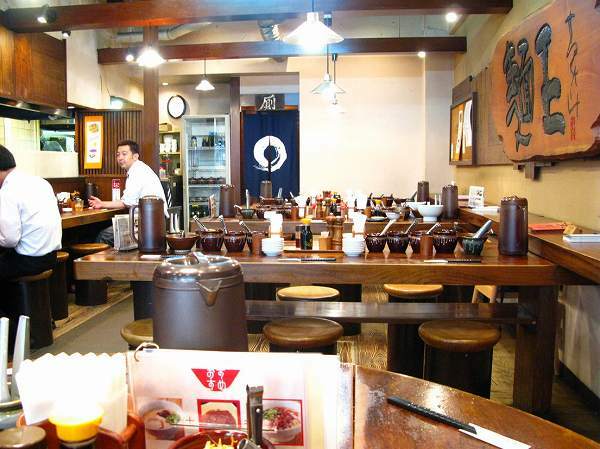 And over 100 shops inspired by Ramen Jiro as well. 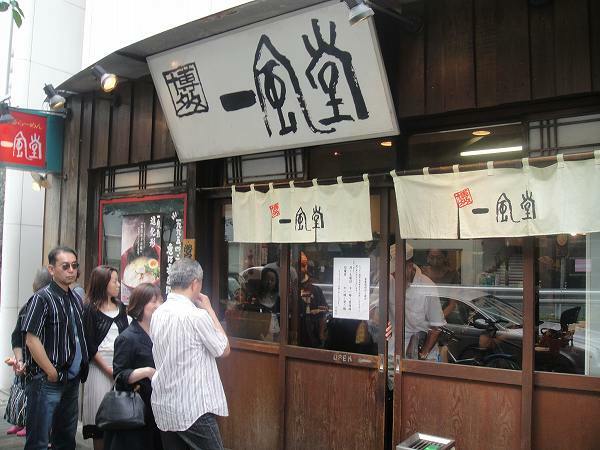 Many Jiro fans enjoy visiting all these shops and they are called JIRORIAN instead of your normal ramen freak. 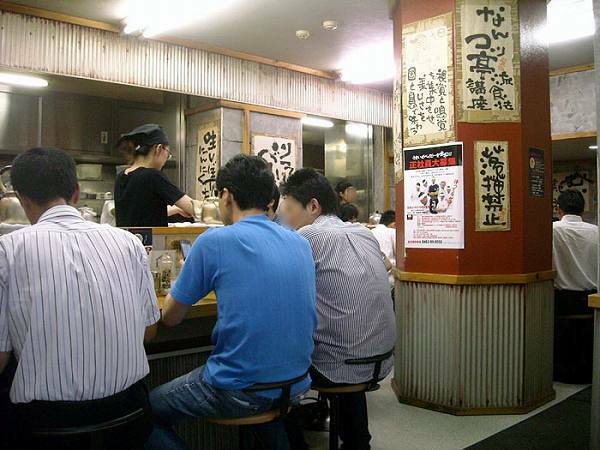 So, what makes Jiro's ramen different from others? 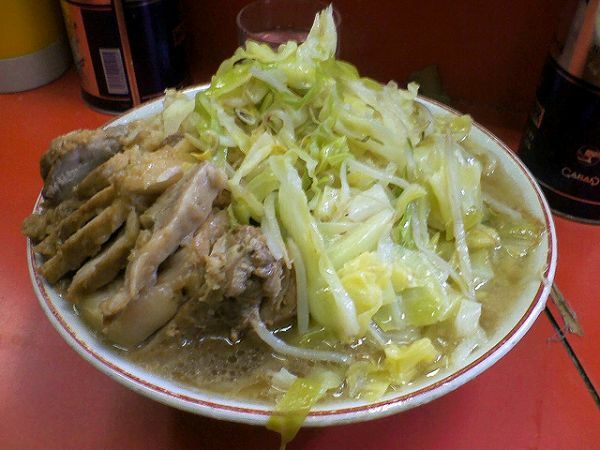 Well, many Jirorian's say that Jiro's ramen isn't ramen, its Jiro. 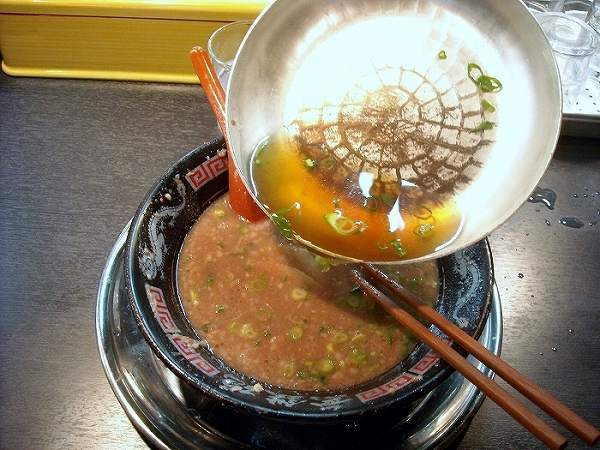 First, the soup is made out of mainly pork meat and fat with some vegetables added. 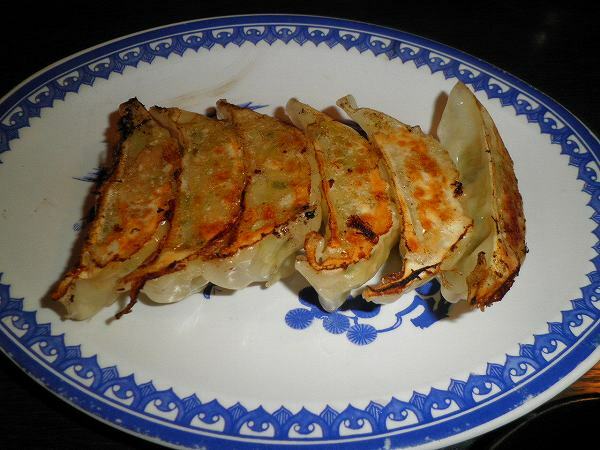 The pork fat makes it extra oily. 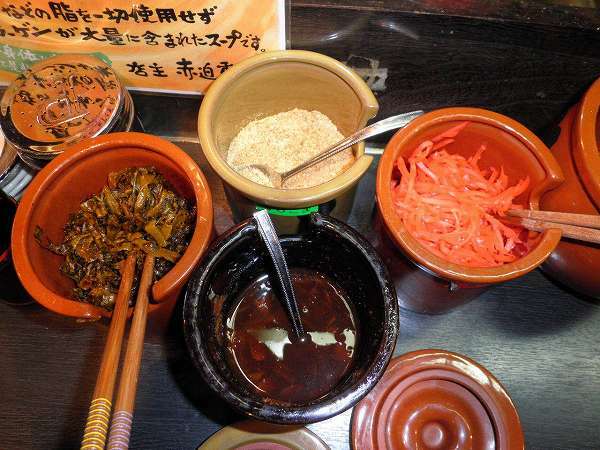 A tablespoon of MSG is added to the soup with soy sauce and Chashu (boiled/roast pork) is called Buta (pork) instead. 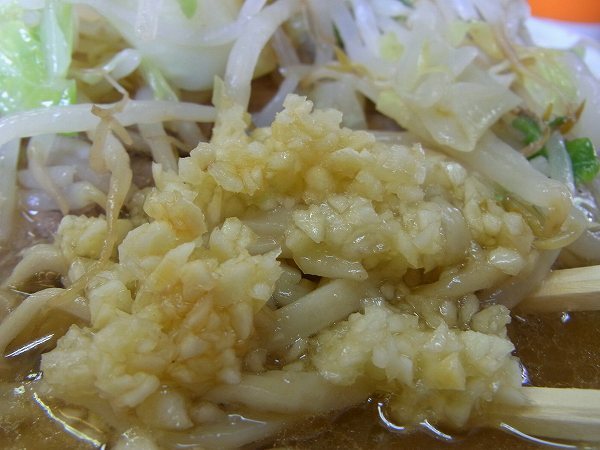 Yasai (boiled bean sprouts and cabbage) is added on the top. 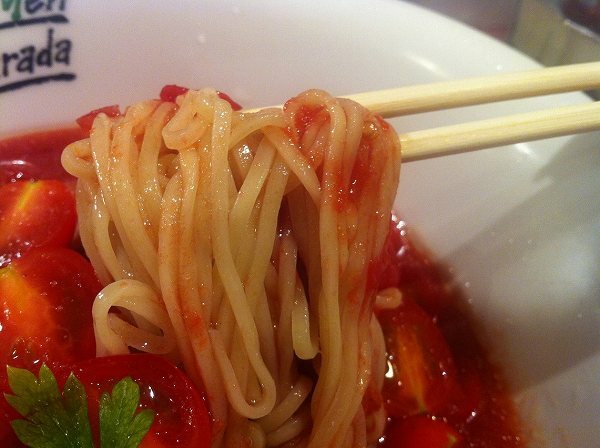 Noodles are extra thick almost like udon. 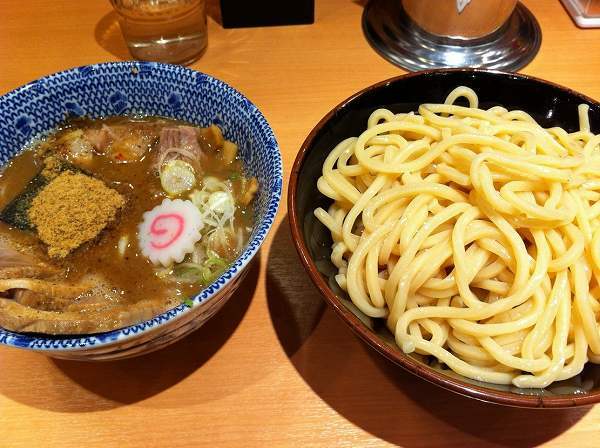 Portions are huge and even the Sho Ramen is at least double the amount of your average ramen. 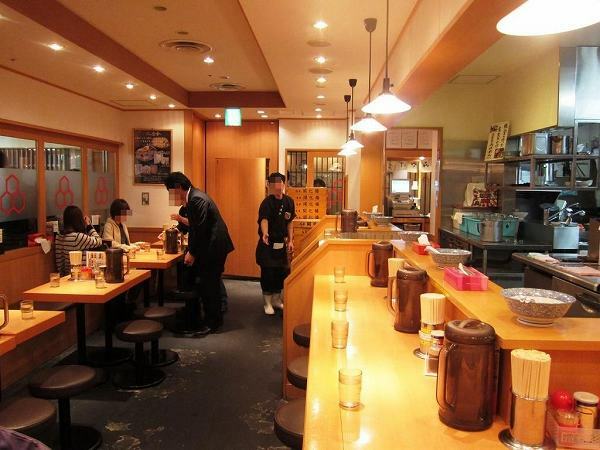 If its your 1st time at Jiro I would strongly recommend to order a Sho Ramen or Sho Buta-iri Ramen. 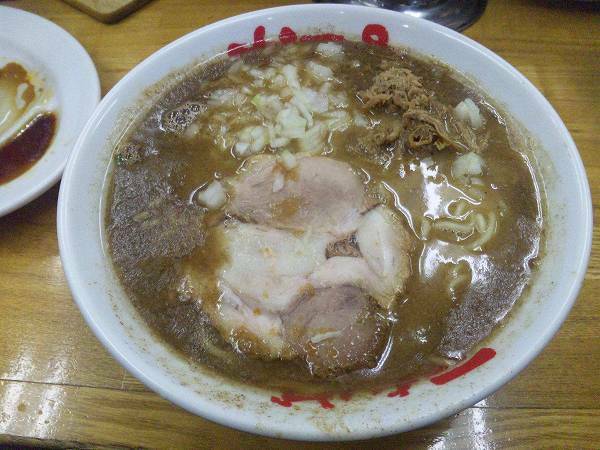 You can order less noodles or half noodles of Sho Ramen, if you think you can't finish a regular Sho Ramen. 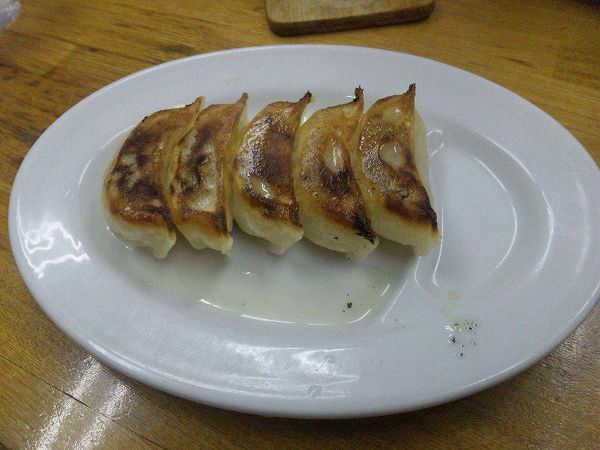 When its ready to serve they will ask you "Ninniku iremasuka" (Do you want chopped fresh garlic added?). 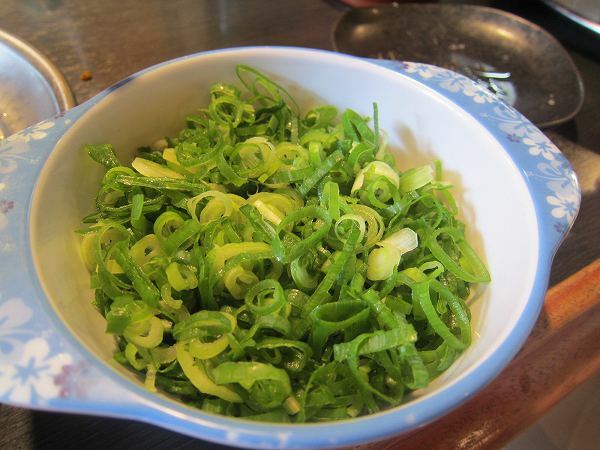 You can not only add garlic, but also Yasai, Abura (pork fat), and soy sauce which is called Karame as well. You can also choose the amount you want to add as well which is all free of charge. 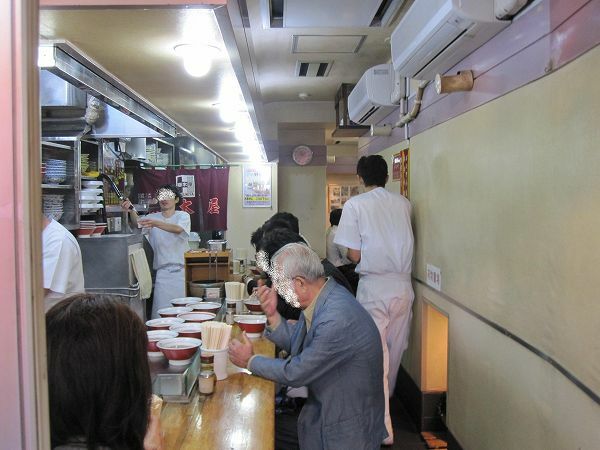 Unless you are lucky the wait at Jiro is minimum 30 min and on a bad day over 2 hrs and also Jiro is not for everyone. 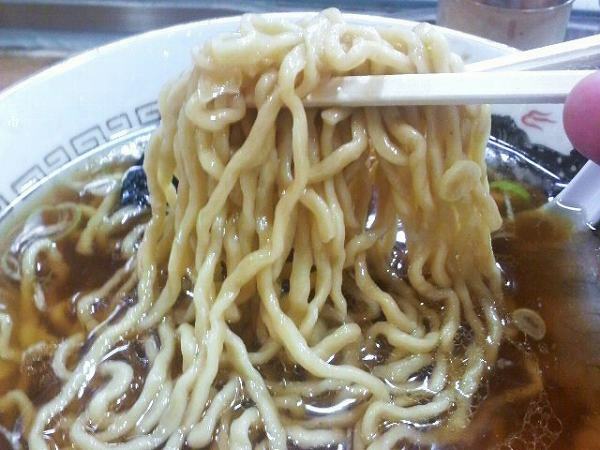 The first time, I ever had it I couldn't believe that it was actually ramen and left most of it. But a couple of days later for some reason I wanted to try it again and have been hooked ever since. Its almost like a drug, once you are hooked, its hard to stop. 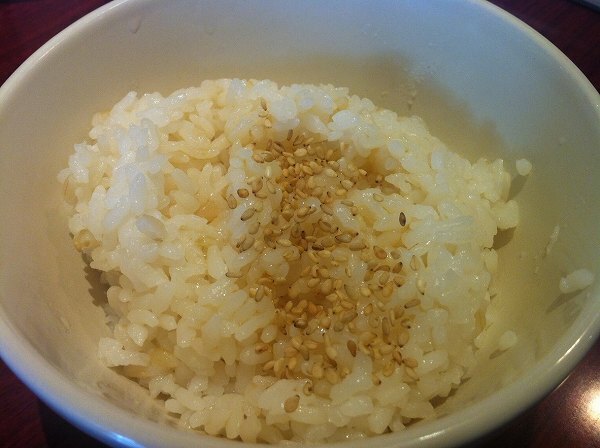 I've only met a few people who enjoyed Jiro from the beginning and my wife was one of them. We both crave for Jiro once a month and although our work schedule won't allow us to go to the one in Mita, we go to one near our house. And I admit that I'm a Jirorian as well. 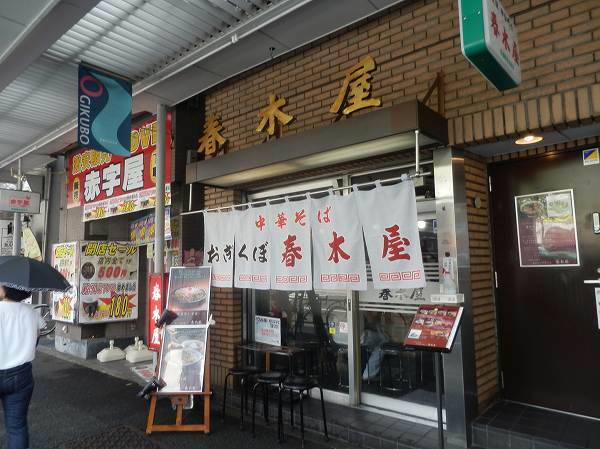 Also, every Jiro shop tastes a little different from one another so find one that you enjoy, but the standard taste is this location. 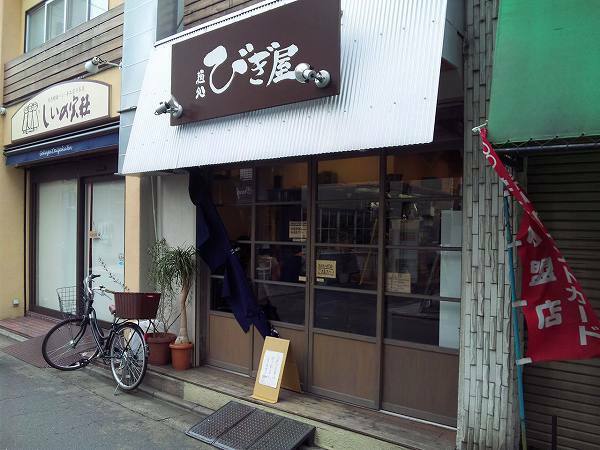 By the way, there is a Jiro near Waseda University now in Takadanobaba.